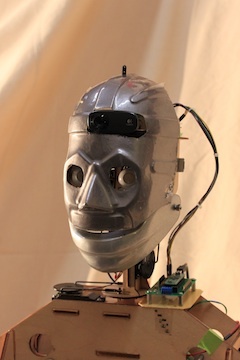 Web site of Mark Medonis, showcasing my long term project Maxwell, an android robot head and torso. There is a kit version of Maxwell available for sale, as well as the individual parts needed to build a robot head. Battery Booster 5 - 9V battery eliminator for BASIC Stamp or any 5V powered circuit. I designed this to help simplify the power setup on Maxwell. It allows the servos and microcontroller to use the same 4.8V rechargeable battery pack.